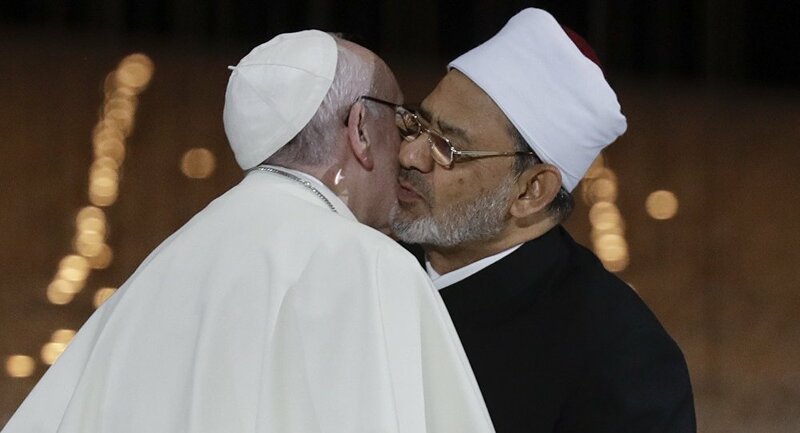 In light of a historic meeting between Pope Francis and Grand Imam of al-Azhar Shaykh Ahmed Mohammad al-Tayeb that took place on 3-5 February, YouGov conducted multi-country research on attitudes to religions in Western countries and the Middle East and North Africa (MENA) region. The survey indicated that 46 and 47 per cent in France and Germany, and 36 and 38 per cent in the US and the UK, respectively, believe that there is a clash between Islam and national societal values. "It is interesting that so much consideration is given to such survey findings without first asking about what this perceived ‘clash' is," Hamza Andreas Tzortzis, a British public speaker and researcher on Islam, told Sputnik. "Rather than a clash between Islam and national societal values, there seems to be a disconnect between what Islam is and what public perception has become." According to Tzortzis, this apparent misunderstanding is "impacting the recent migration crisis": "When we strip away the labels, the migrant crisis boils down to vulnerable human beings looking for safety and security," he opined. The researcher highlighted that "from my experience" relations between both Christian and Muslim communities "are getting better". "However, to continue improving relations we need authentic engagement and dialogue where people genuinely listen with a view to understand the other's perspective. People, especially influentials, must take the lead and convey the universal message of understanding, co-existence, tolerance and forbearance," Tzortzis pointed out. For his part, Joshua Landis, an American academic who specialises in the Middle East, presumed that public opinion could have been shaped by the long string of revolutions in the MENA region. "Middle Eastern societies are going through a period of crisis and revolution," Landis noted. "The Iranian revolution was the first Islamist revolution. It turned out a secular, pro-Western government. The Arab uprisings of 2011 are in some ways a continuation of this upheaval. Many secular, military leaders have fallen as a result or, in the case of Syria, almost fallen." According to the American academic "this upheaval has many causes: economic, political and the desire for freedom and dignity": "The old order in the Middle East had become corrupt, oppressive and dysfunctional," he opined. However, the 2011 uprisings not only failed to "bring about democratic governments and liberation" but resulted in the spread of "terrorists groups, many using Salafist Islam as justification for acts of violence and attacks on the West," he said, adding that "immigration and refugee numbers have gone through the roof," being triggered by chaos and civil wars. "It is little wonder that Europeans look on this upheaval as dangerous and threatening. It is also little wonder that they associate it with Islam," he suggested. Meanwhile, "we see western governments throwing up walls and other barriers to immigration from predominantly Muslim countries," Landis said, presuming that "fear of Islam is natural outcome." 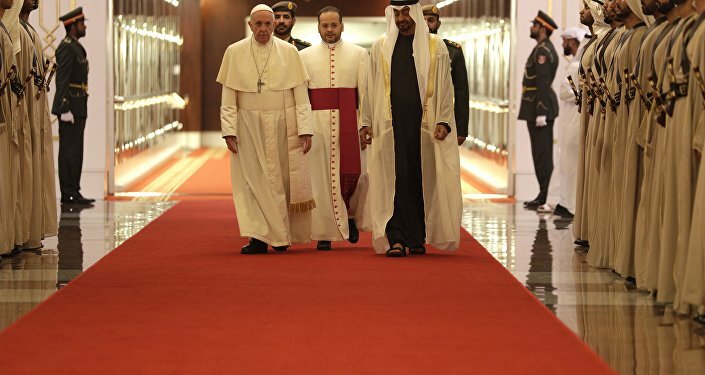 Commenting on Pope Francis' visit to Abu Dhabi, Tzortzis suggested that "in the grand scheme of things anything that symbolises peaceful coexistence between people of different faiths and spiritual traditions is very good." However, "unfortunately, the message that is conveyed by such symbolic events does not always filter down to the target audience", the researcher said, emphasising the need for a "multi-layered approach." He expressed scepticism about the clash of civilisations theory of Samuel P. Huntington, stressing that "binary thinking, in the context of society and politics, always results in absurdities". When asked as to how the Abu Dhabi Declaration for World Peace and Living Together signed by the pope and the grand imam of al-Azhar may affect the ongoing Middle Eastern crises, including the war in Yemen, the researcher opined that "religious figures do not seem to have significant influence over foreign policy, and one could argue that the war in Yemen and elsewhere has little to do with Muslim-Christian relations." "We live in an excessively ideological world," Tzortzis said. "Today, ideology unfortunately trumps ethics… However, anything that promotes good is positive, even if has limited influence." Pope Francis made a trip to the United Arab Emirates (UAE) from 3 to 5 February. During the historic journey the pontiff met with the grand imam and celebrated a Catholic mass with 135,000 people. On 4 February, Pope Francis and Shaykh Ahmed Mohammad al-Tayeb inked the historic document that declared "the adoption of a culture of dialogue as the path; mutual cooperation as the code of conduct; reciprocal understanding as the method and standard." For his part, Sheikh Ahmed Mohammad al-Tayeb called upon Muslims to "embrace [their] Christian brothers and sisters." "They are companions in the state. They are close to us. There are special bonds between us," the grand imam emphasised.